Shares of Bandhan Bank and Gruh Finance fell sharply on Tuesday, a day after the board approved the amalgamation of Gruh Finance into Bandhan Bank through a share swap deal. Most global brokerage firms have maintained their rating for Bandhan Bank, but expressed doubts about the synergies that the deal would offer. Macquarie maintained a neutral rating on Bandhan Bank with a target price of Rs 540. However, the global investment bank is of the view that the acquisition of Gruh from minority shareholders’ point of view is a wrong decision. Shareholders will be paying 13 times for Gruh as against 4.5 times paid for Bandhan. The minority shareholders get short-changed with 26 percent dilution, it said. The global investment bank added that it does not deny Gruh’s excellent franchise and growth story, but it cannot ignore the price paid for it. As per the arrangement, shareholders of Gruh Finance will get 568 shares of Bandhan Bank for every 1,000 shares of Gruh Finance. The merger will reduce the promoter’s stake in Bandhan Bank from current 82.3 percent to 61 percent. This is at an 8 percent discount to the closing price of Gruh Finance as of January 7, 2019 and at a ~2.5 percent premium to the last six months average price. Another investment bank, JPMorgan maintained ‘neutral’ rating with a price target of Rs 525. “It is an expensive buy; merger synergies may be hard to come by,” the note said. The global investment bank said that the merger allows a path for reduction of promoter shareholding, but more needs to be done. “Combined entity will be a leader in microfinance and rural housing and should attract higher valuation,” it said. HDFC, which is likely to benefit the most from the deal, will end up holding 14.96 stake in the merged entity. The deal can be seen as a fallout of Reserve Bank of India’s earlier decision to impose a restriction on Bandhan Bank for failing to reduce promoter shareholding as per the agreed regulatory timeline, suggest experts. HDFC will have to bring down its holding in merged entity below 10 percent as per the norms. The merger ratio is EPS and Book value dilutive for Bandhan Bank by 6.5 percent and 12 percent, respectively. It is a win-win deal for HDFC Bank, Motilal Oswal said in a report. HDFC incrementally has an increasing share of affordable housing both in volume and value terms. “HDFC could monetise its investment in Gruh Finance at a very attractive valuation (13.3x Trailing BV). Post-deal, HDFC will have a 15 percent stake in the bank. According to regulations, it can own a maximum stake of 9.9 percent in another bank (as already shareholder in HDFC Bank) subject to regulatory approval. If it sells 5 percent stake, then it can fetch Rs 4,000 crore (based on combined M-cap of Rs 80,600 crore on the deal value),” it said. Gruh Finance has developed a very profitable and niche business franchisee over the years. 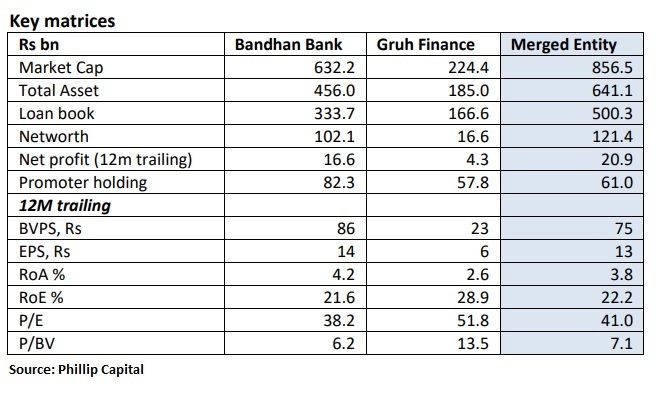 So, the acquisition of Gruh Finance by Bandhan Bank is pricey. Both the entity caters to the bottom of the pyramid segment and hence the acquisition can be termed as complementary from Bandhan’s standpoint. Moreover, geographically it seems like east meets west. Bandhan is dominant in east India with 51% of its distribution network in eastern India and only 8.5% in western India. On the contrary, Gruh Finance has a dominant presence in western India. 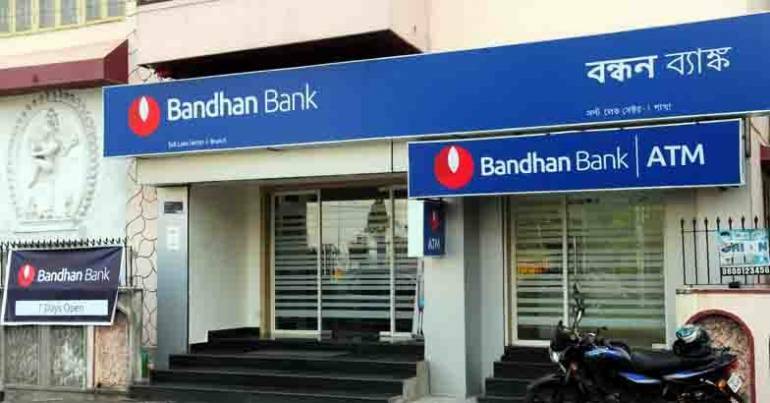 Phillip Capital in a report said that Bandhan Bank being a micro finance entity enjoys high spread and return on asset (RoA) of 4.25% (trailing) compared to 2.6% for Gruh. Post-merger, the RoA of the merged entity is expected to compress. “The acquisition is expensive for Bandhan Bank and it does not fully resolve promoter stake dilution concern. The bank needs to bring down its promoter holding to 40% from 82.3% currently,” it said. The note further added that the acquisition will help Bandhan Bank diversify its product basket and de-risk portfolio by addition of secured loan product. “We view the acquisition to be pricey in short term but if the scale-up of this business continues to remain profitable than it can provide benefits in long-term,” it said.